Charles Dickens has of course become famous for his intricately woven tales of social injustice and rampant poverty. Yet the author also provided his readership with an enormous host of intriguing, elusive, bizarre and sometimes even grotesque characters, most of whom he gave especially fitting and equally fantastic names. For your special delight, therefore, we serve you just a dram from the full range of Dickensian characters and their names. Which are your favourites? In Little Dorrit, the Italian Mr Cavalletto is a veritable showcase of those attributes at the time thought of as belonging to the typical Italian. The stout shopkeeper in The Chimes, whose name is just too fabulous to admit omission. More great Charles Dickens facts here. Viola van de Sandt is a postgraduate student in English literature at King’s College, London. She loves writing about women in English and American novels, and does exactly that on her own blog, Broken Glass. 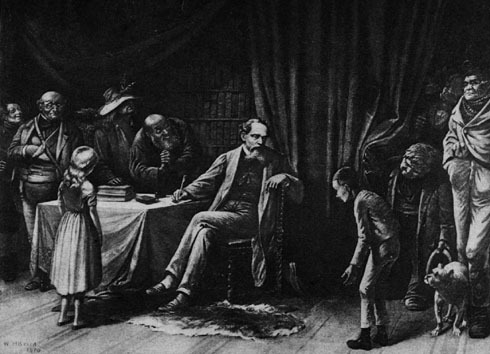 Image: Dickens Receiving His Characters, William Holbrook Beard, public domain. I wonder what he would have thought of today’s names. Moonstar, Jade, and so many artist weirdo names. I always thought Mr. Bumble was a very appropriate name. I thought I was well up on Dickens until I read this list and couldn’t recognize several of the names until I had read the descriptions. Even after the description, I still have no memory of Mrs. Chickenstalker, despite the eye-catching name. No worries – I had to search for these names in online lists to remember ;-) Thanks for your comment! Reading concepts like these, I should give Dickens another chance. I’ve only experienced him through required reading in high school. I see what you mean. I never liked Dickens in high school, and only started appreciating him a few years back. Thanks for your comment! Right you are, Chickenstalker IS a fabulous name.